We helped ski-loving startup DAHU build a platform to make it easier for people to find and book services in the mountains. They’ve already helped launch 100+ experiences and their mountain marketplace is on track to revolutionise the tourism industry year-round. The entrepreneurs behind DAHU were frustrated at how cumbersome booking a ski guide could be and wanted to make mountains easy. Less admin, less guesswork, more time for fun. Instead of the traditional blend of cash payments, word of mouth and patchy communication, they asked us to create a new method of connecting tourists to instructors so they could book direct. We could see this had the potential to become a useful app. But we didn’t just go away and deliver it, because there’s a stage between briefing and execution which is the most important of all: Discovery. During the discovery phase our founding team worked closely with DAHU to explore and interrogate their brief, getting to the heart of what their vision was and why it mattered. It quickly became clear that there were exciting possibilities beyond booking ski guides. Together we identified two important sets of end users: the travellers looking for a mountain experience, and the service providers who meet their needs. Not just ski and snowboard instructors, but chefs, massage therapists, childcare providers and taxis. The traditional model we needed to improve on was one that relied heavily on word of mouth recommendations and local networking: haphazard, opaque and difficult from afar. We walked hand in hand with the clients through the booking process to make sure that the user experience would be smooth, seamless and social, from real-time chats and recommendations to splitting the bill. Our in-house team created the appealing Dahu identity, launch site and promotional video. The whole process took place in an agile development environment, so we could test each functionality on the fly. We love solving complex problems, and Dahu was no exception. 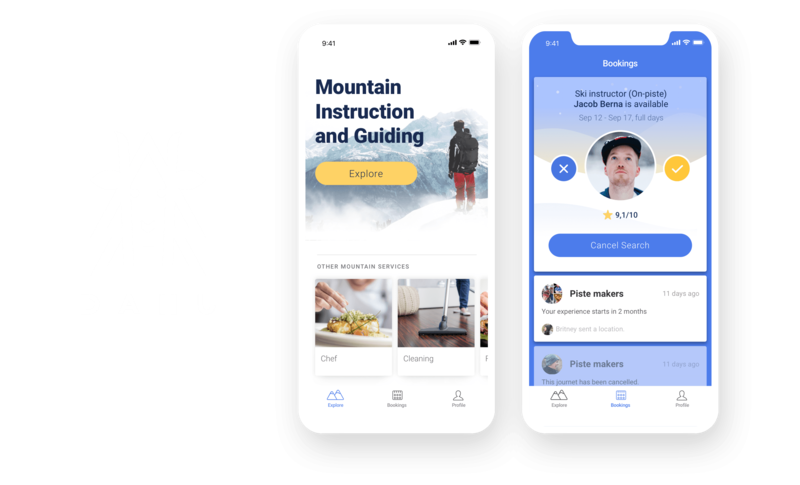 We built an on-demand platform for the Dahu app to match tourists to guides: skiers post requests and ski guides respond to them. We chose React Native and GraphQL to create a rich user interface and fast, stable backend, supported by a payment platform that could handle the complex functionalities we needed. It was important that the platform was lightning quick and smart enough to withstand spotty connectivity in the mountains. The payment processor had to work with multiple local currencies as well as support affiliate commission, bill-sharing and the specific needs of all the various users. We were briefed to create a brand based on the mythical mountain creature Dahu is named after, incorporating imagery around both skiing and year-round mountain adventures. Our team came up with a mark and logotype incorporating a mountain goat, skis and a pine tree in a totemic style with fresh, energetic colours reflecting the values of the brand. We chose to animate the promo video in house to avoid high filming costs and to gel with the fun and stylish Dahu vibe. We know the industry and the business model but are not familiar with building the actual technology. Despark has been a great coach, discussing what was and wasn’t important at each stage. When developing something, we can do everything or only attempt a few things. Despark has been adept at helping us think through the process.